Recently Google rolled out a huge change to the image search interface, on the outside this may seem like a huge step forwards, the new interface is much nicer and more streamlined for a normal user. Google constantly strive to improve the internet for users, and this is by no means a bash against them but more my observations following a recent update. 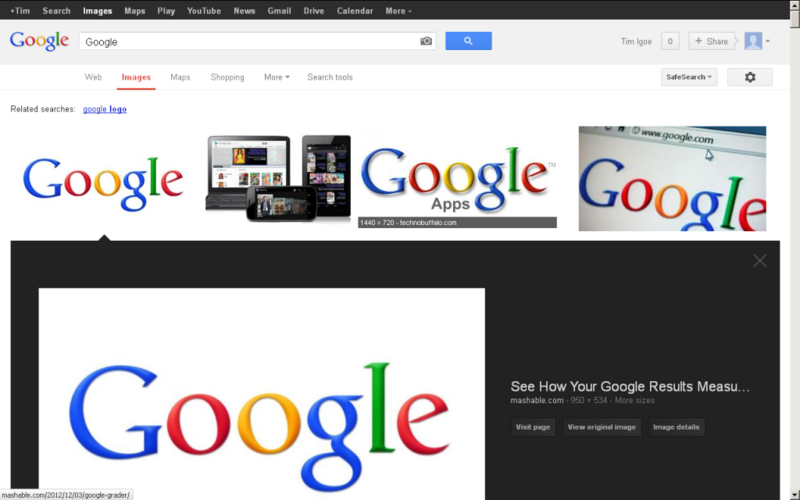 Since the update to the Google Images Search have been released, users now see a very different view when browsing for images. Previously whenever they selected an image they got a preview of the image, in place on the site it came from. This showed the user the image in context and let them either do what they wanted to with the image, or go back and carry on with their search. However, with this latest update they never actually see the site the same. They are presented a much lager view while being kept within Google’s search. The new search does make it easier for the user to click through to the site, but adds a further step to do this. It also gives the user a much larger preview without actually going to the site in question. From the users point of view, this is much quicker and more responsive as the data is always being served from Google and their vast quantity of servers. Since the upload of this, one thing I have noticed with a couple of my sites that are heavily image based is a huge drop off in visitors actually hitting my servers, they are able to get the images searched for directly from Google without even leaving the search engine. As they never leave the search engine, they never see the context of the image, nor the extra content that might be relevant around it as well. Basically, Google are copying images without permission and re-distributing them themselves, without the person who did the upload being able to track number of views / downloads etc. While that is already possible for someone to steal an image, its now being made even easier. Google’s Blog entry on the subject can be viewed http://googlewebmastercentral.blogspot.ro/2013/01/faster-image-search.html – they are also encouraging feedback on the subject. We must embrace change, or the internet would never improve, however as with a lot of vast changes on the web all parties need to work together to make sure its beneficial all around. Previous Post The Stupid Cookie Law – Dead at last? I got a severe drop in traffic since the new system, between 15% and 25%. So no, this new system is not good for webmasters hosting images. People should not be able to see HiDef images without a visit to the page.